Tricky time pulling our tent up from the Campsite wetland. The ground water making a powerful vacuum seal. Sssslllluuurrrpp. Final visit to the portaloo hidden amongst the long grass and snakes…and off we cycle. At the ferry port a full-on TEURI ISLAND festival underway. Wooden clogs, dragon masks, dried fish served to around. Lots of fun. HIGH PITCHED string instruments, school brass band, taiko drums…an interesting blend. After we dismount and settle for a picnic lunch beside the harbour, Heidi, “Right, I have absolutely no idea what is inside any of these rolls or rice balls, so take your pick”. Picnic Russian Roulette. Today, I get the bullet: lukewarm fishy something disguised as tomatoe sauce. Sam & Joe enjoying their choice (sweet red adzuki bean) as Daddy sprints for the harbour pier. The bullets are rare, but good for spicing up a rice & rolls picnic. So, one very rough ferry crossing before setting off after midday (we normally start before 8am) for a drizzle mist 75km. Black clouds never quite materializing. But scaring the hell out of parents anyway. Very slick evening operation finding campsite late afternoon (empty but open!) with grass (NOT wetland), toilet block (NOT portaloo hole-in-the-ground), shower (NOT wet wipes), and coin laundry & drier. Sam & Joe find a hill to roll down. The manager brings us a blanket to make our night that bit more comfy. Camping gas spaghetti alla Heidi (fresh ingredients). Solid days cycle touring. Plan to repeat tomorrow. More bloody rain forecast. A bit of rain we can live with (we cut our cycle tour teeth in Scotland & Iceland), but not the heavy all day stuff we finding here. Touring with children, we pick our rainy cycle days carefully. To base ourselves in a good rainy day place we must cycle over 100km today (we end up doing 108km, 6.5 hrs saddle time). We must also cycle through 22 tunnels. 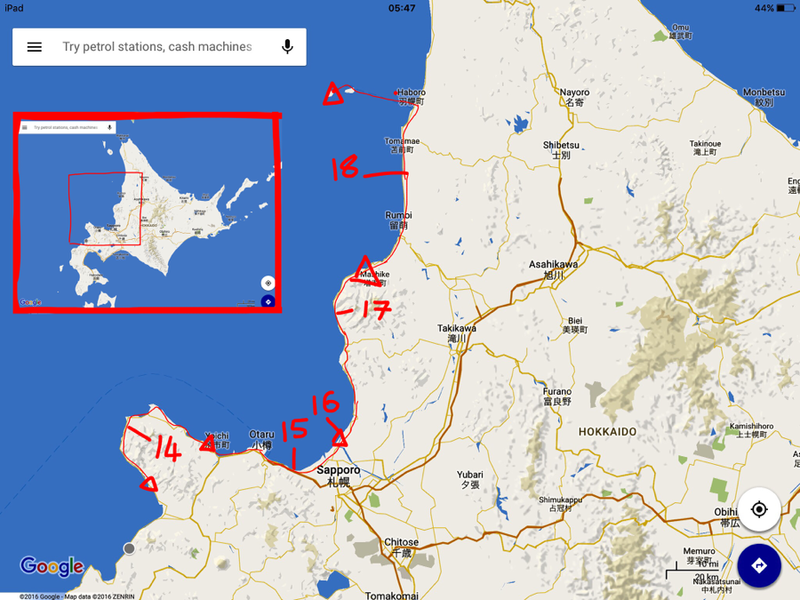 Between the tunnels we are treated to more of Hokkaido’s jaw dropping geography. Why had I never considered Japan and it’s many islands as a destination before? With the domestic population of 178 million easily sustaining tourist hotspots, there’s probably been no need to market itself to the west. Not for the first time, I find myself envying the Japanese living on this huge chain of islands stretching from sub-Arctic to sub-tropical. When we arrived at our destination town, exhausted, a man selling ice-creams invited us into his garden shed and gifted us delicious takiyaki (octopus pancake balls with dried fish flakes). Making chit-chat in Japanese while in a state of near collapse was challenging but, the warm welcome was just what we needed. Kindness & generosity has been a common theme on this six month journey: important to remember for when the going gets tough. Wrapping up the day with a 3m X 3m freely available beach hut/palace…the perfect space (our own space!) for tomorrow’s rainy day. Ah, a luxurious day of boredom and cabin fever ahead. Rainy day, got our own space. Sit tight, listen to some music and just chill…as if! ..Mummy Macaskill and her boys ain’t so great at being bored either. So while there was some time spent catching up on diaries, letters, blog (! ), needle felting and drawing. There was also a good deal of local exploration in the wind & rain. A fantastic looking closed cafe; black beach sand sculptures of cute animals & bullet trains; a boardwalk over a field of Roses; ONSEN hot spring & tasty ‘cully lice’, ‘hambaga’, and seafood noodle soup. Many ONSEN hot spring double as large indoor public spaces (necessary considering the ridiculous amount of rain here). It’s standard to find inside a shop selling local foods packaged in obscene amounts of plastic (Japan rather likes wrapping food in plastic). Also a quiet calm space in a tatami mat room, perhaps with the television on showing baseball, sumo wrestling, a game show, or a soap opera suicide. 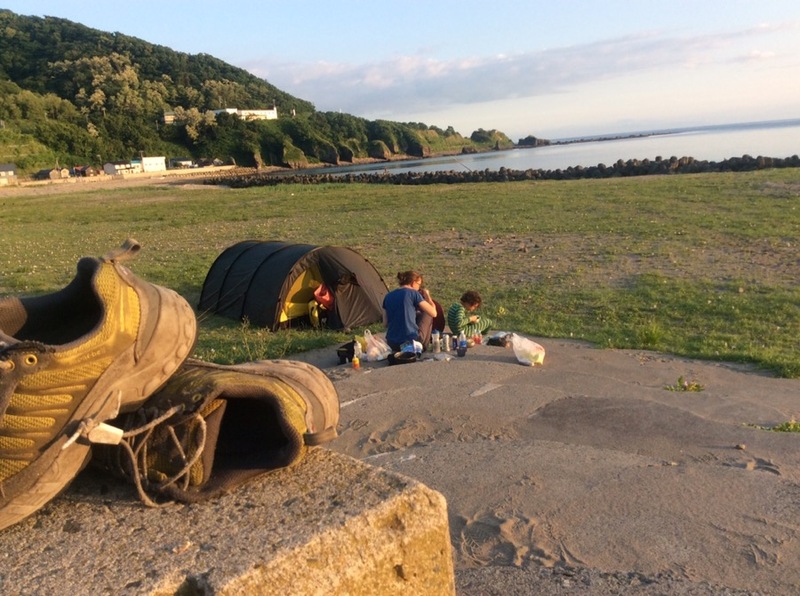 We return to our beach hut/palace and crawl into our sleeping bags laid out on the floor. Our green tent inside it’s bag. Dry. Rain gone. Urban riding all day. Pavement hopping, terrifying tunnels, two punctures on separate bicycles within 1 km of each other. And then a collapsed front pannier rack. To fix this, I must find the plumbing section of a home build store. My front pannier now sports a pipe clamp, cable ties, coat hanger, and electrical tape. It still has a 5inch section of bamboo from a repair job made 5 months ago. Six months on the road and our brightly coloured yellow fluoro jackets are no longer brightly coloured. Sam’s cotton shirt is more waterproof than his waterproof jacket. We desperately need re-proofing liquid. Nothing is quite what it was 6 months ago. Including us. 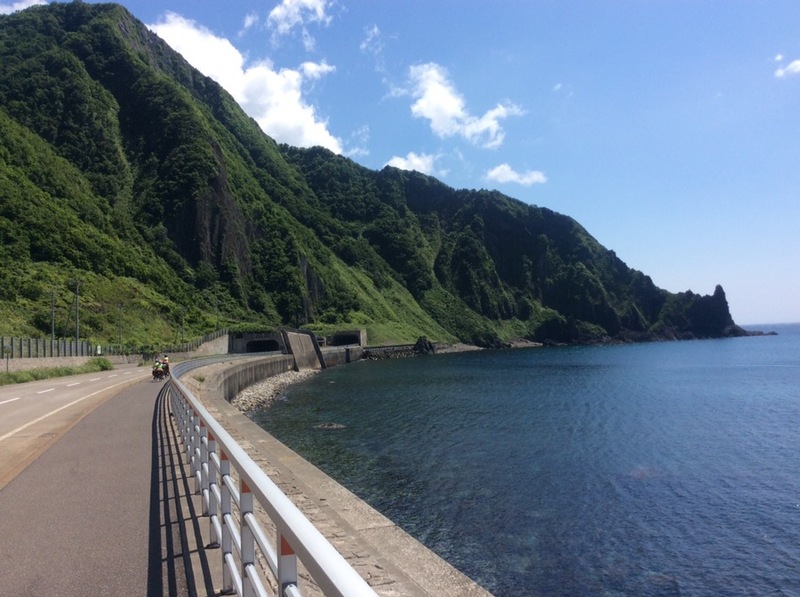 Sunny with tail wind pushing us along beside the beautiful Sea of Japan with mountains plunging deep into it’s crystal clear waters. Busy little fishing ports with their hotpotch mixmatch of modern and decaying houses. No planning permission required here.Any colour goes. Any style. Modern houses have sharp angles. Blends of simple functionality & aesthetic. The older houses made of wood we prefer. Unfortunately they are less practical and, having endured countless winters of wind & rain, have been abandoned in favour of insulation and double glazing. They lie in various stages of collapse. The roads are quieter and tunnels have pavements, removing the growing sense of dread with each new BBBBBBRRR. There IS always light at the end of each tunnel, even the long ones. Near the exits, just before we are spat out into a brand new scenery, Swifts dart in and out, Joe points excitedly, “look, look up there, they’ve made their nests”. One time we emerged from a tunnel, blinking, to find ourselves soaring high over a gorge looking far out to sea, before quickly getting swallowed again. Mole Eagle Mole. Tonight we camp on a beach in a sleepy fishing port with a public toilet block designed in the shape of a boat. Sam & Joe spend two hours designing race tracks in the black beach sand. Tunnels feature strongly. We all walk to the harbour wall to catch the last of the setting sun. The last day that our Joe is seven years old.